Active@ UNDELETE allows you to create virtual entities - disks and partitions to emulate real once without affecting data on physical devices for better access. Thus, user can emulate actual physical disk by assigning different values of disk geometry properties and read data from device if different sequence and interpretation. Application also supports non-RAID arrays, like spanning of drives, when several disks are simple concatenated in a single big one. Created virtual RAIDS appears in Recovery Explorer view and can be handled as real disks with partitions and volumes for purpose of file recovery. Due to nature of these objects, partition restoration on them is impossible. See: Disk arrays (RAID's) for information about how to select proper RAID type. 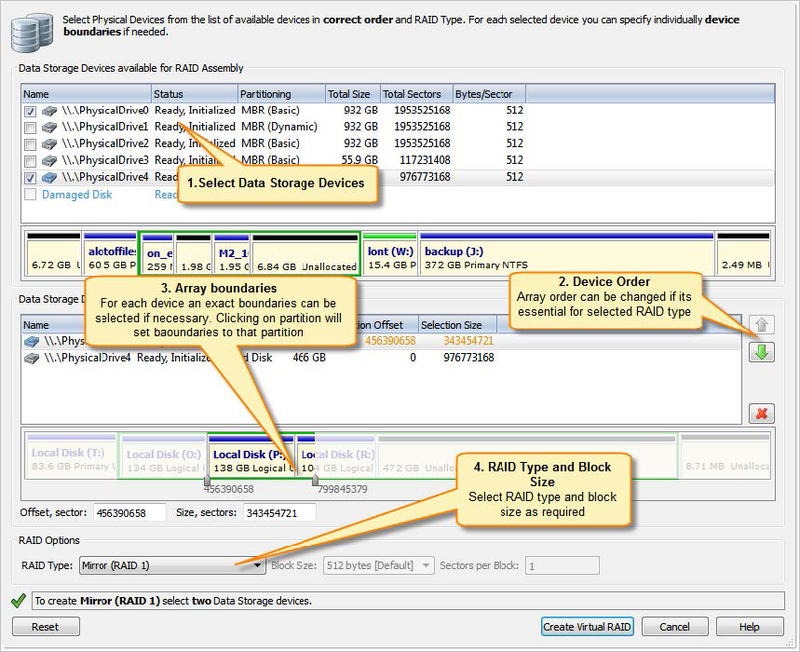 For each selected disks offset and size can be defined to specify part of a disk used in RAID assembly. By default entire disk is used in disk array. Note: For each selected disk, used disk range can be set individually. Tip: Click on disk partition or unallocated space to select entire partition or unallocated space to disk range for RAID assembly. Note: To display creation events and progress details, click Details. Note: To terminate the creation process, click Stop at any time. Results may be not accurate or complete. As a result, assembled virtual RAID must appear in Recovery Explorer view as a device, ready for scan or other actions applicable for virtual devices.